Today we launched automated emails in Intercom. A feature that evokes the old Spider-Man quote: “With great power comes great responsibility”. 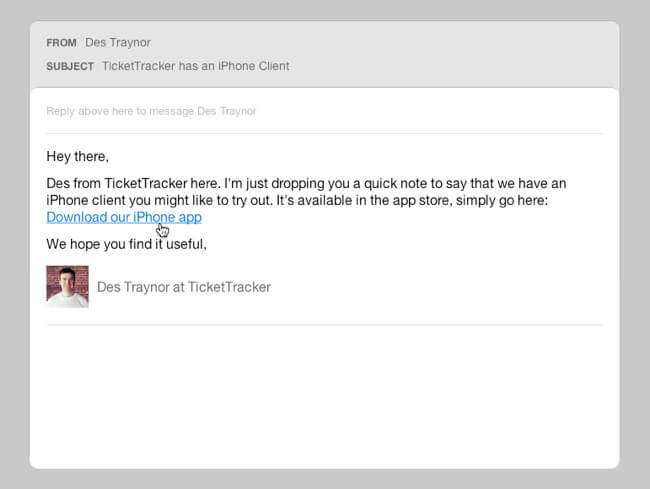 The feature lets Intercom customers automatically email their users as they meet certain criteria. For example: “Automatically email users after 7 days if they haven’t added a teammate or created a project” or you can promote a particular aspect with a mail like “On day 15 tell all iPhone users about the iPhone app, if they haven’t already installed it”. If you run or work with web applications you can quickly see how this feature is powerful for increasing engagement, providing great customer experiences, and helping with retention issues. But you have to show your customers respect for their time and attention. Despite terms like “Drip feed Marketing”, “Lifecycle Marketing“, and “Automated Marketing” gaining massive traction lately, we’ve been hesitant to label this feature along these lines as they are all features that ignore the new nature of online business. They relegate customers to mere data points who are to be hammered with emails based on their every action, as we can see in the screenshot above. We don’t believe in it. This type of interruptive marketing ignores how online business is changing. It’s disrespectful, and is based on poor assumptions. For example, automatically emailing everyone to “remind them to log in” is the result of a self-deluded mind. A more appropriate question would be “Why has this customer not logged in 30 days?”. It’s unlikely they thought the product was great and simply forgot about it. Solve that problem first. Every communication sent costs social currency. 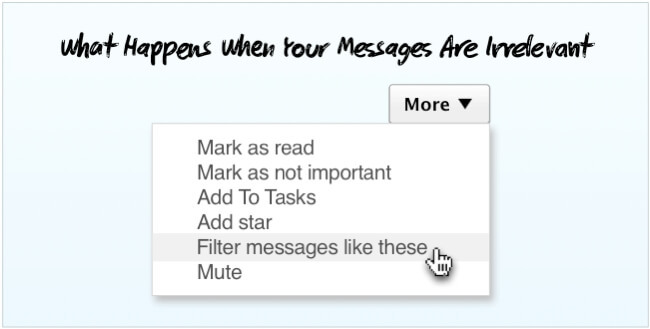 Every irrelevant or inappropriate email adds data to a user’s internal inbox filter. This is why open rates are so painfully low. You can A/B test subject lines all day long, but if your users have already decided your emails are nonsense then neither A or B is gonna change their mind. If you’re not being filtered by a rule, you’re being filtered by a mindset. When MailChimp tells me that I can email 10,000 Intercom users for $100, that sounds like a good price. We can measure ROI on that. But if I do email 10,000 users about something they don’t care about, it’s really hard to measure the damage that does. I can count unsubscribes and cancellations, but that’s never the true cost. The true cost, in simple terms, is this: The more you shout at someone, the less they listen to you. This applies well beyond running web applications. Interruption and broadcast marketing are dying, remnants of a customer-hostile era of business. There are times when it makes perfect sense to interrupt your customers—that is what you’re doing, don’t forget. Big announcements, important timely news, imminent actions—all of these things are worth interrupting a customer for as they probably want to or need to know about them. Writing to all your customers at once heavily limits what you can accurately say. Inevitably your message and tone degrades into a bland one-size-fits-none mess full of ifs mights and maybes. You have many different types of customers who vary on price plan, activity, team size, how long they’ve been with you, how feel about your product and many other variables. Breaking down your message by the most appropriate variable massively improves the impact. 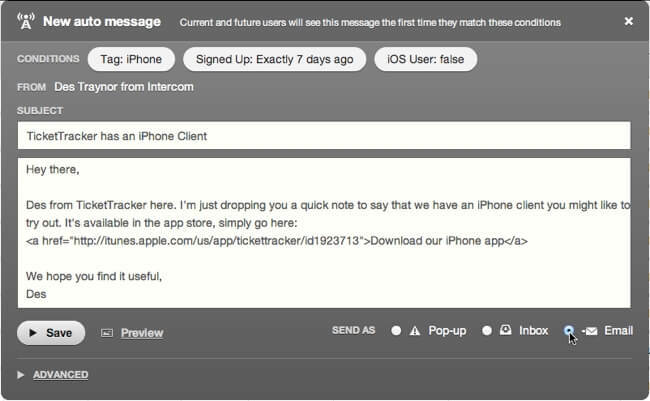 As an example, if you wanted to tell your users about your iPhone app, you could dump a message out to everyone. That’s the zero points, old style way of doing it. Not everyone has an iPhone, some already have your app installed, some have barely used your web app let alone installing your iPhone app. Targeting isn’t difficult when you have the right tools available. Here’s what it’d look like in Intercom. In 30 seconds you’re now emailing the exact people who want your iPhone app, that is, those who have an iPhone, haven’t installed your app and signed up a week ago. You can easily improve this with further filters if you have better data. Emailing your users based on actions they perform in your application, while they’re in your application, is silly and looks meaningless, but this is often the approach by auto-mailers. Similarly sending daily summaries outside of working hours, or on weekends is often badly targeted. With more than 40% of emails being received on mobile devices, users are now getting mails as they arrive, whether they’re on a golf course, in a nightclub, or on driving home. Don’t be surprised that click through rates are so low. No one likes speaking to “support” or “accounts”. People talk to people. Such labels dehumanize conversations and let customers feel justified in blowing up at a company. After all, who is “accounts”? They certainly don’t have emotions. Any communication with a case number or a “No Reply” policy doesn’t feel like a conversation, and because of that it’s likely to get ignored. We’ve tried to tackle this in Intercom by including some extras in each email. By include a photo and full name in each email, we have seen much more meaningful conversations take place. People are wowed to see the actual person behind the application. They’re more forgiving, caring, thoughtful, helpful, and loyal. It works. All the available data says that the impact of email is dying. While the top e-commerce sites are now sending an average of 177 mails to their customers each year, open rates are plunging, along with click through rates and response rates. This supports what we’ve seen in similar studies comparing emails against in-app messaging. People are tuning out to bad emails, so we need to stop sending them. Regardless of the tool you use for automated mails, take care to message the right users at the right time, in a personal manner. It’s the only way to show your customers you care. After all, as Ken Hammer noted, you wouldn’t write a passionate love letter only to address it “To Whom It May Concern”.